This finger injury makes you unable to extend or straighten the end joint of a finger without assistance. It can happen from sports and other daily activities and causes pain and tenderness to the area. The severity of the injury can vary from a stretching of the tendon to the tendon coming unattached from the bone. Symptoms of a mallet finger include pain at the end of the finger with particular tenderness when touching the back of the finger. The giveaway sign is that the patient will be unable to straighten the end joint of the finger without assistance or considerable pain. There are no muscles in the fingers, instead, they are moved by long tendons which connect to muscles in the hand and forearm. When the muscles contract the tendons move in channels through the wrist and up to the end of the fingers to produce movement. 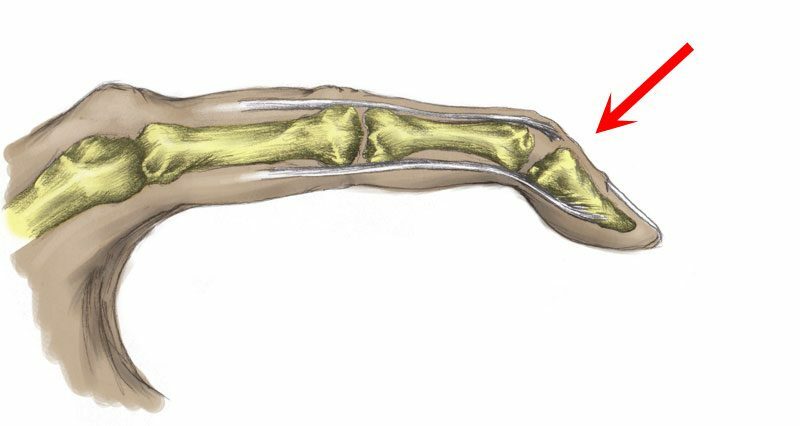 On the back of the finger, along tendon of the extensor digitorum communis muscle attaches. When the muscle contracts, the finger straightens. If this tendon is damaged, torn or injured then the ability to straighten the finger is affected. The degree of damage can range from a minor stretching of the tendon to an avulsion of the tendon which means it has come away from the bone altogether. Mallet finger occurs most frequently from a ball, for example, a basketball striking the fingertip, forcing it to bend, whilst the extensor muscles are contracting. In other words, stubbing the finger. It can also be injured doing work related or household activities such as making the bed. Treatment depends on the severity of the injury. An X-ray or MRI may be used to determine if the tendon is torn if there is an avulsion or a fracture to the end bone of the finger. If there is no avulsion or fracture, then a mallet finger splint may be worn for up to eight weeks. This holds the end joint of the finger in an extended position to allow the tendon to heal correctly. It is also recommended that this type of splint or taping is used for an additional 1-2 months when returning to sport or overnight for sleeping. It is essential that the patient wears the splint all the time except when washing the finger and even then they must keep it straight. Failure to be strict on wearing the mallet finger splint may result in the injury not healing correctly and the patient will be left with a drooping fingertip requiring further treatment or surgery. If this is the case or in more complicated injuries where the tendon has come completely away from the bone, mallet finger surgery may be performed to reattach the tendon to the bone and realign any fractures. Again a period of immobilization will follow. Mr. Elliot Sorene MBBS FRCS (Tr & Orth) EDHS Consultant Orthopaedic, Hand & Upper Limb Surgeon explains Mallet finger surgery. It is often caused by a ball such as a basketball hitting the end of the finger or even another player impacting with the end of the finger. Also, cases are known where the patient falls onto the end of the finger or stubbing the finger doing household activities such as making a bed and causing a mallet finger injury. After the injury has occurred the patient will not be able to extend their finger because the tendon has been pulled off the bone, known as an avulsion strain. If this injury is caught early on then it can be treated conservatively with the patient having the finger immobilized in a straightened position with a Mallet finger splint for between 6 to 8 weeks followed by a month of wearing the splint at night. In the vast majority of patients, this will heal. In a few patients, the finger will still droop at the end but this is probably due to the patient not wearing the splint all the time and not keeping the finger in a completely straightened position. In this case, if the mallet finger does not heal then there is the option of surgically reattaching the tendon and reconstructing the fingertip where results are typically very good.